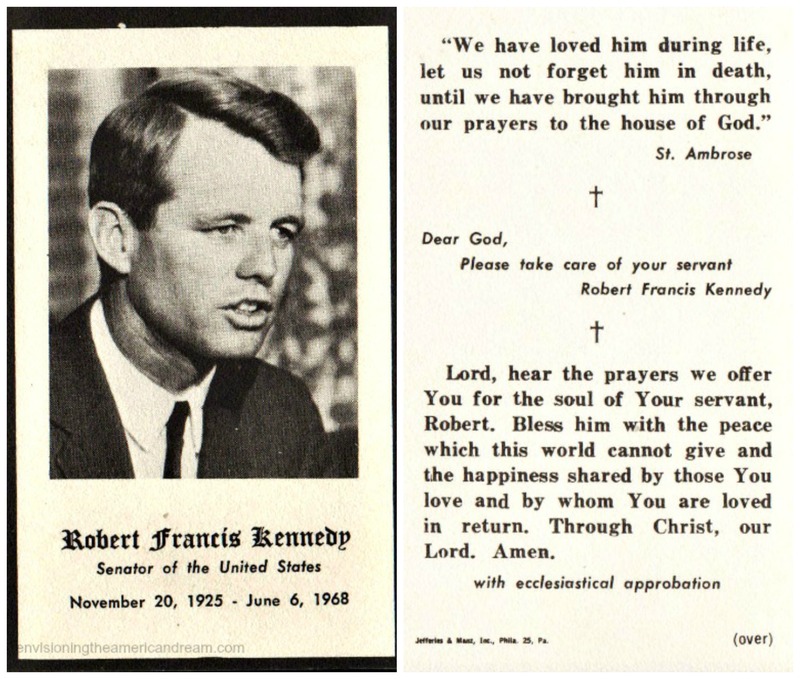 I never met Robert Kennedy but I was always grateful I was able to bid Bobby a final goodbye. On a sweltering Friday in June of 1968, I joined the hundreds of thousands who lined up outside St Patrick’s Cathedral in NYC to pay their final respects to their fallen hero. Americans were in a state of disbelief. It could not happen again – yet there it was. 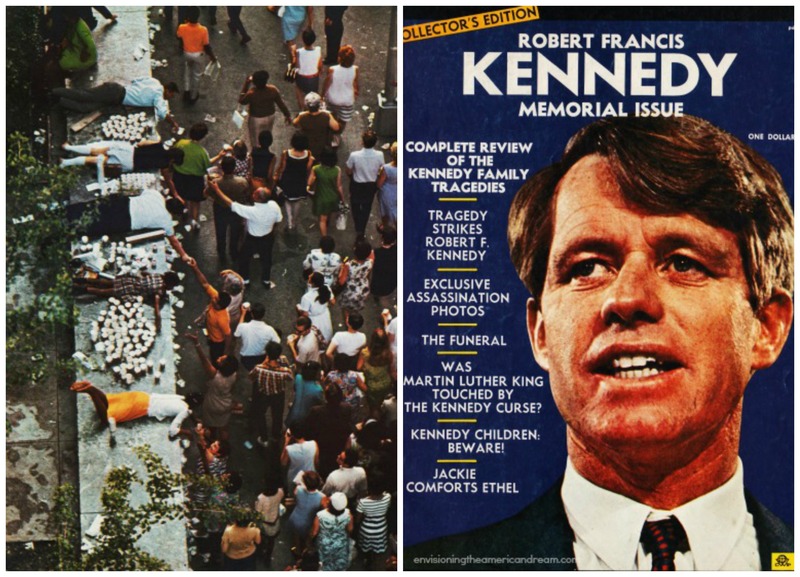 With terrible symmetry an assassin had struck down Robert Kennedy early in the morning of June 5th and once again a nation was left to watch and grieve and wonder. The awful drama that had played out on TV the past few days had left us all, young and old, feeling lost and helpless. The Kennedy family had flown his body from California to NY where he would lay in state at St Patrick’s Cathedral giving the public an opportunity to pay their respects on Friday. Like millions of others engulfed by the drama of those past few days, I needed to touch the event myself, to establish even the smallest piece of it as having taken place in my presence, to see it and believer it and lock it in personal recollection. As a 13-year-old who had volunteered my afternoons working on Kennedy’s Campaign for President it seemed essential. A half hour train ride to Manhattan from my suburban home was all that was necessary. Long before my mother and I boarded the Long Island Railroad that Friday morning, the lines of mourners had already begun forming. By early morning when the St Patrick’s Cathedral doors swung open, the line of mourners was already swelling to well over a hundred thousand waiting in the early morning humidity. Simmering in the June heat, the crowded city streets were bustling with commerce as Mom and I made our way uptown to St Patrick’s from Penn Station. I loved Manhattan with the noise and grime and glitz and especially the kaleidoscope of people. Swinging down crowded Madison Avenue lined with skyscrapers and smart shops, girls rushed to their glitzy secretarial job to fetch coffee and type 60 words a minute on their IBM electric typewriters. Liberated career girls on-the-go in-the-know-letting their now young looks show, with frosted pink lips and frosted hair, dressed in Bobbie Brooks groovy go togethers they were taking dictation by day, yeah yeah yeah, making the scene by night frugging the night away at their favorite discotheque. Madison Avenue mod fashionistas glided like gazelles sporting their -Vidal Sasoon’s hard-edged geometry hairdos on their way to Conde Nast. The Real Mad Men of Madison Avenue fresh off the 7:37 from Greenwich were sprinting from Grand Central in giant strides to make their 9:00 meetings.Wrinkle free and fresh in their summer weight Dacron suits,nothing announced to the world that you were a man of discerning taste the way a garment of 100% Acrilan did. By the time Mom and I arrived at St Patricks, the lines were strung out over 6 and 8 and 10 abreast over 25 blocks of mid-town Manhattan forming a vast chain of sadness. The crush of people was overwhelming. The vibrance of the crowd belied the sorrow that loomed over us all It was a crazy crush of color happy Celanese separates, vibrant in sun coral, refreshing in turquoise and electric in jubilee orange. The sun was baking down and the crowds were wilting from the 90 degree heat but their no wilt, wrinkle-free clothes looked as fresh as the zingy floral prints, popping polka dots and pastel paisleys that decorated them. 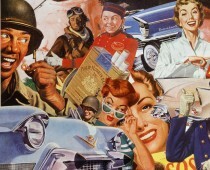 A wave of humanity in a sea of synthetics. It was a veritable sea of drip dry, and wrinkle free, a wash n’ wear tribute to Postwar man’s progress over Nature, a cornucopia of the space age convenience of miracle man-made fabrics. Out of some deep sorrowing patience they stood all day in a wilting sun and through a stifling night – an amalgam of populace from all walks of life. Heartbroken housewives from Bayridge Brooklyn, a gaggle of amber waves of trouble-free Toni home permanents that had not unfurled in the humidity stood side by side with Park Avenue doyens fresh from their standing Friday hair appointment at Kenneth’s, that flawlessly tailored pet of the set who flocked to his posh paisley swathed town house at 19 East 54th Street. Ladies who lunched, their red-rimmed sorrowful eyes hidden behind their Foster Grants who stopped by after a quick run through at Saks Fifth Avenue, shared space with teens with ravaged faces splotched with skin colored Clearasil, teens with angry sunburns gotten the weekend before on Memorial Day, teens,who like me had taken the day off from school. Nuns, shrouded in black in their austere habits, their normally stern moral certitude shattered, mindlessly fingered rosary beads, lined up next to weeping girls in mini skirts and Dynel wigs their Maybelline mascara running copiously down their cheeks. Middle aged men in sporty natty Lido telescope straw hats with fancy woven bands rubbed elbows with beefy construction workers in hard hats who stood solemnly next to peace kids in tied dye shirt and beads, hippies in pieced together outfits from second-hand stores, attic trunks and funky shops. Grief stricken ex-GI’s and their blue cheer whiter-than-white families living the second generation of American subdivision dream, stood shoulder to shoulder with Blacks from Bedford Stuyvesant, that God forsaken urban blight of burned out houses, forgotten by all except Robert Kennedy. Hundreds of them came from Bed Sty, leaving the sour stench that permeated the Myrtle Willoughby IND subway station for the rarefied air of Fifth Avenue. To honor the man who had worked so hard for them. Some were activists and community leaders from that beleaguered community second generation victims of urban poverty, now mournfully reminiscing for anyone within earshot, of their brief encounters with Kennedy. Some had been there that cold day in February 1966 accompanying RFK in his historic walking tour of Bedford Stuyvesant . Kennedy had seen it all, unvarnished, the burned out buildings, the brownstones in abject decay, plaster falling from walls,,vacant lots teeming with garbage, the stripped cars rusting on the streets. One woman standing next to us, resplendent in her Sunday best, wept openly as she recalled to Mom and me how only last June Senator Kennedy had been in Bed Sty, and she along with several hundred people had crowded into the courtyard of an abandoned milk bottling plant to listen to among others, Senator Kennedy speak. The purpose of the gathering was the announcement of the Bedford Stuyvesant Restoration Corporation, the nations first community development corporation that would try to regenerate Bed Sty. She would never forget that day or the warm handshake and sense of hope she received from Senator Kennedy. It was the first bit of hope for Bed Sty in decades. “It’s hard keeping faith when everything’s gong so bad,” she wailed repeatedly. No, he had not forgotten them. They would never forget him. For 6 hours we all stood and waited for a seconds glimpse of the coffin with the white wreath at the feet, the spray of roses at the head, the US Flag and the rosary on the burnished lid. Some snapped cameras. Some touched the wood and crossed themselves. It was mostly a day for the Bobby people- the young the poor the black, the disenfranchised. 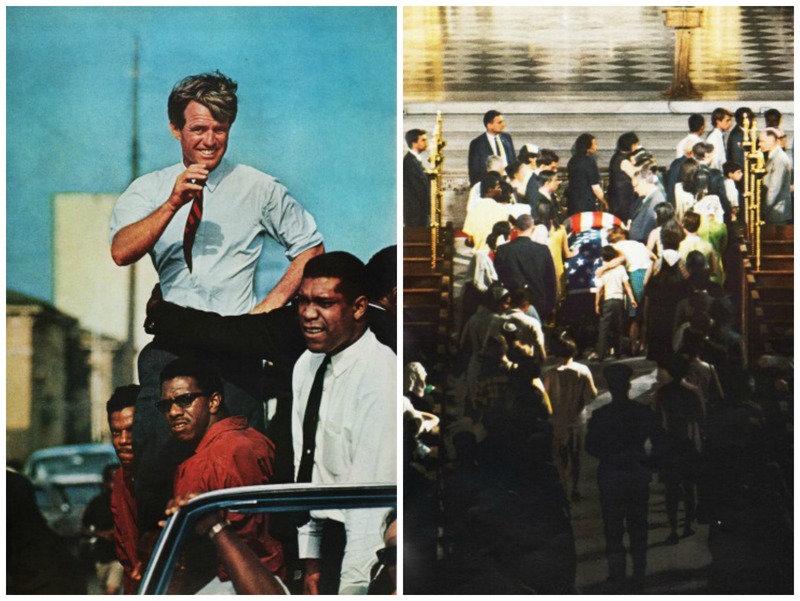 It was the day the family gave Robert Kennedy to the public for the last time. This world needs Jesus now!!! 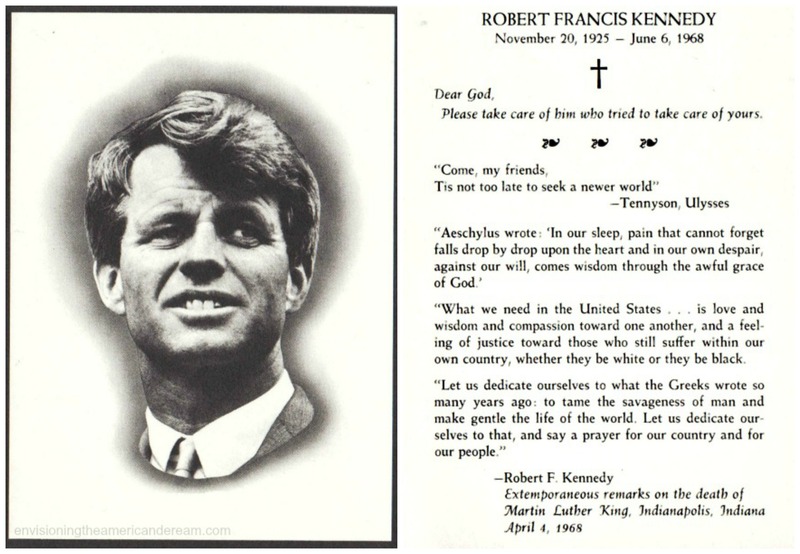 I was just two years old when Robert Kennedy was killed, and it’s affecting me now!! Because I know good people are very hard to replace…He really cared about people, I know I will see him one day, because I know the God I serve! !